Several months ago, my husband’s aunt hosted all of us for a Sunday dinner and asked everyone else to bring along a sweet. About a month before that, just after our niece was born, I brought over a meal to my Brother and Sister-in-Law and made them some brownies. SIL asked if I would make them again, so I agreed and then I was rooting through my cupboard and found a bag of peanut butter chips I had brought back from the US and I decided to make some blondies too, since Tim’s sister loves peanut butter. Both were a big hit, and when Tim’s aunt decided to host a family dinner again, the request came through from my sisters-in-law (sister-in-laws? How do you plural SIL?) for brownies…..and blondies. The only problem was that I had used the bag of PB chips last time and as it was a grocery item from the USA, I had no way of getting them. 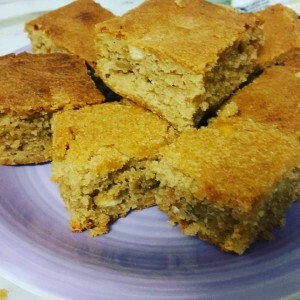 So, I went on a hunt for a decent PB blondie recipe. Pinterest yielded a bunch, and then my sister (from another) linked me to a recipe. It only had seven reviews and one review said it was more like a cake, but there also was a side bar link to another PB bar recipe, so on analysing both recipes and then converting down to metric, I came up with this recipe. It’s still a little more cakey than a traditional brownie, and I think I used more white chocolate last time, but these are pretty peanut buttery! 1. Pre-heat the oven to 175C and spray a tray bake tray** with fry light or line with baking parchment. 2. Cream together peanut butter, butter, and both sugars. 3. Add vanilla and add eggs one at a time. 4. slowly mix in flour. 7. Allow to cool in the pan for 10 minutes before turning out onto a cooling rack. I did not calculate syns for this treat, but I do know that peanut butter has a lot of syns in it. Something like 4 or 4.5 per Tablespoon (15g! ), so at a bare minimum you would be looking at at least 6 syns per piece (if divided into 32) at a rough estimate using flora light instead of stork, and that’s without the white chocolate chips too. So…..yeah. This has lots of syns in it. If I was planning on keeping it at home, I would work out the syns more accurately, but since I’m taking this to a party, I’m not concerned in knowing. *I would love to try this out with almond butter or other non-peanut butter butters for people with peanut allergies. I bet it would taste really good! **I bought a pack of 10 tray bake trays at ASDA for Â£1 or Â£2 that I’ve been using every time I make brownies so I can easily give it away to someone without worrying about getting the tray back.